I started 2009 off with a cold that unfortunately turned into bronchitis. And I’ve been at home coughing, trying to relax and shake this thing for entirely too long. Consequently, I got bored and decided to make something. I am a horrible when it comes to just relaxing–I get antsy way too easily. Now, I realize I probably shouldn’t be baking, but I’m bored and my coworkers are desperate. The holidays are over so that means no more parties and no more packages from vendors, which in turn means no junk food at the office and serious withdrawals. One of my coworkers even said he’d risk getting sick if it meant he’d get his fix of sweets. Seriously. My big weekend highlight thus far has been my trip to Trader Joe’s today. I noticed the Candy Cane Joe Joe’s, and after hearing people rave about them every winter, finally decided to pick up a box. And maybe it’s just me, but I don’t understand the love these things get. Call me a purist, but I don’t need candy canes in my filling. Anyway, knowing I wouldn’t eat the cookies, I decided to make something with them. After going through my pantry, I figured I should probably use the condensed milk that would expire soon, so I went to the Eagle website and found this recipe. The fudge, although I hesitate to call it that, because the texture is nowhere close to smooth and creamy, is good. Unfortunately, I think the mint flavor of the cookies is overwhelming, so if I were to make these again, I’d probably use just regular Oreos. Then again, we’ll see what my daring coworkers have to say about these treats on Monday. In heavy saucepan, over low heat, melt white chocolate squares, EAGLE BRAND® and salt. Remove from heat; stir in crushed cookies. Spread evenly into wax-paper-lined 8-inch square pan. Chill 2 hours or until firm. Turn fudge onto cutting board; peel off paper and cut into squares. Store leftovers covered in refrigerator. Those fudge squares look ridiculously good! I never could have imagined such a yummy treat! well at least it’s an easy recipe! perfect for alleviating boredom without wearing yourself out. That looks an awful lot like the recipe on the inside of the Baker’s chocolate box (minus the cookies). I bet this would be good with lemony sandwich cookies too! I’m with you on the Candy Cane Joe Joe’s. Luckily I had a free sample at the Tucson Zoo Holiday Lights and didn’t have to fork out money for them. Sorry to hear that you have been under the weather. Bronchitis is definitely a bad one; I got it when I was about six years old and dropped eight pounds because I couldn’t keep anything down. Bad stuff…good luck getting over it! 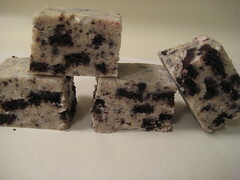 I need to go get some oreos right now and make this. Looks so good! Everybody seems to be under the weather, what with all the coughing and the sneezing going on. But recipes like this can really make someone feel warm and mushy inside. How about joining us at Foodista? We have launched an online food and cooking encyclopedia ala wikipedia. We’d really love to have this nice and quick recipe included. See you there! Wow, your picture makes my mouth water. I must try this one soon, it looks so yummy. So what did your coworkers think? I just saw the thin mint post – that one is definitely going to happen! @the wicked noodle – They LOVED it. The Thin Mint one is a huge hit too. This was super fast and easy to make. It’s very sweet, but it’s addictive. The salt and the cookie crunch are delicious. I cut it into one inch cubes and it filled three small tupperware containers–perfect for giving away.